Do Google reviews show in search? Yes - always - on a desk-top/laptop and in mobile (well over half of searches are conducted on mobiles now). At present there may appear that there is little logic - or correlation between - your reviews and your appearance in search, but, rest assured, Google are working on it. Do Google reviews influence our appearance in the Google 3-pack? Everything you do on your own website and on Google is taken into account as far as Google is concerned. Bear in mind that it is in Google's interest to show the best businesses in search, and what better way to indicate the best than the businesses which, in the opinion of G+ users, are the best? If you follow the golden rule: that everything Google can find out about you on the web adds up - you won't go far wrong. 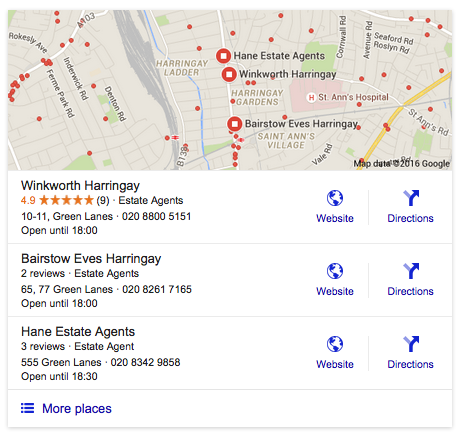 When will Google begin to rank estate agents by review score? We don't know (and Google won't warn anyone before they do) - but if we were Google we would wait until there was a critical mass of reviews of estate agents - what that will be no-one - maybe not even Google - knows. So our advice to our clients is simple: be ready! Do Google reviews influence our appearance in natural search? Yes - they are far from the only influence Google takes into account, and that may change - in favour of reviews - in the future - but Google give their own reviews such prominence in search that there is only one conclusion to be drawn: that reviews rank high as far as Google's search algorithm is concerned. Should we be paying for Google PPC (Pay Per Click)? 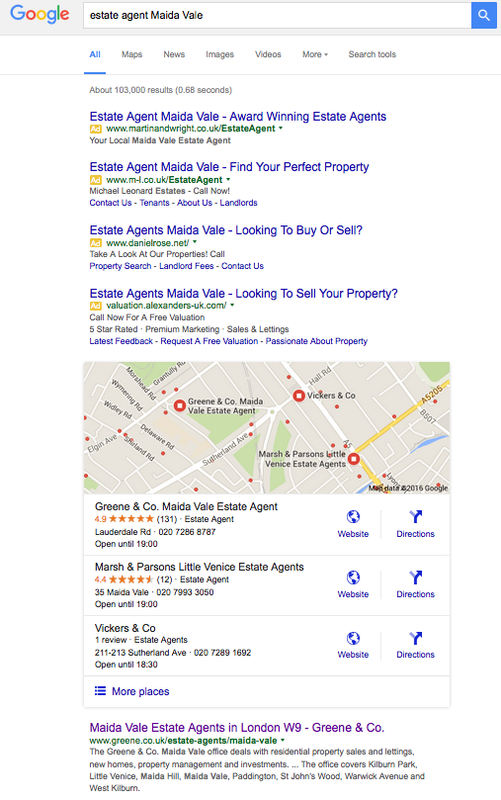 Here's a screenshot of a popular search - estate agent in [location] - which agent do you think looks most attractive to potential fee-earners? The ones advertising (PPC) or Greene & Co? OK, Green & Co are a client of ours, but we don't think they are unhappy (or currently feel the need to advertise - PPC - to get their reviews seen or for any other reason). Maybe this question needs rephrasing. How about "Would we rather look great in the Google 3-pack and in natural search?" If you can save valuable marketing spend by looking great anyway, why wouldn't you? Should we be paying an independent review site to get us a score to show in PPC? This is an interesting one; as review managers we monitor all the relevant review sites and how their results show up in search. Independent sites' ratings mostly appear in paid search (PPC). Google reviews always appear, in every relevant search. Maybe that's the simple answer - Google wins every time. For more on this subject read Independent review sites: Today's Answer to Yesterday's Question. Should we be paying an SEO specialist to improve our position in natural search? SEO (Search Engine Optimisation) is one of the web's 'black arts'; it is effectively all about fooling Google into ranking one business above another in natural search. For that reason Google devotes extensive resources to defeating SEO. We tend to advise clients to devote their energy and resources to getting their customers to help them look great, and leave the SEO for those whose customers may be less likely to volunteer great reviews. Having said that, a good professional web designer will build - and maintain - your site so it is highly visible to Google and is returned in relevant searches. If your site is languishing, have a word with your website people, but do bear in mind that only one business can rank top for any given search. What is the Google review filter? Who wouldn't set the filter at 4.0? When will it apply to estate agents? Sooner rather than later is our guess. One thing you can be sure of is that Google won't warn anyone, it will just be there one morning, just as it was for hotels this January 1. Be ready - see above. Can we appeal to have a negative review removed? *if you are not a HelpHound client we strongly advise that you consult an experienced new media lawyer. They will draft and manage your appeal for a fee. Can we choose which of my Google reviews show in search? No. Google will show your reviews in the order they choose. 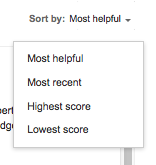 This always defaults to 'most helpful', but the user can choose any one of the following (and almost always chooses 'lowest score' before deciding to contact the business in question). Does Google delete reviews after a certain period of time? No - not yet. But sheer logic dictates that they will at some point in the future. If you have taken over a business and there has been a fundamental reorganisation we recommend that you contact Google through their Google My Business forum. Should we be posting/active on my G+ page? We often describe your G+ page as the filing cabinet that Google goes to to see if there's anything about your business they should be showing for any given search. So to expand on that metaphor: fill that filing cabinet with as much relevant information about your business as you can lay your hands on, especially reviews - never mind that your prospective customers are not swarming to that page - they are seeing its contents displayed in search. Should we be encouraging people to 'follow' us on G+? 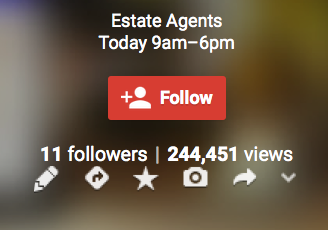 This screenshot of part of an agent's G+ page tells them two crucial things: first, that they have 11 followers (they could do with as many more as they can muster) and second: that Google has served the information contained in their G+ page nearly 250,000 times in search. If this were your business wouldn't you want those searches to include your great Google reviews? Yes - for the simple reason that Google sees a business with 100 followers as bigger (and therefore perhaps more relevant in search terms). Start by encouraging all your staff to 'follow' you. What is the Google My Business Community? It is a forum where you can ask others in the community - but, importantly Google staffers as well - any questions about Google practices and absolutely anything else Google related. In our experience Google are pretty good at coming back with relevant and helpful answers. It's here. TripAdvisor Awards 2016: See Torquay and Die!